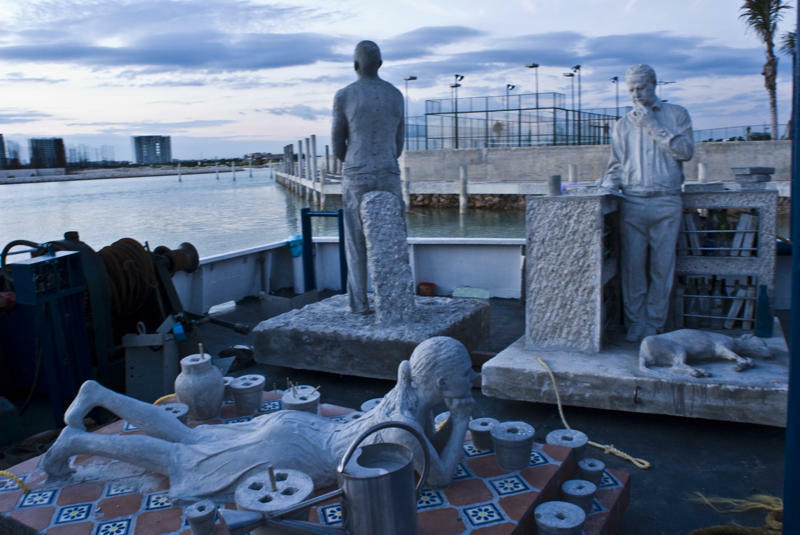 Puerto Morelos Blog: Cancun's Underwater Sculpture Museum is Underway! The National Park West Coast of Isla Mujeres, Punta Cancun and Punta Nizuc, which receives approximately 750,000 tourists annually, will feature more than 400 concrete sculpture figurines comprising the world’s largest underwater museum, right in the waters in front of Cancun and the island of Isla Mujeres. The project has been put into place to give the natural reefs the opportunity to flourish at a cost of more than $350,000 usd. The Marine National Park has stepped up to the challenge of diverting tourists away from natural habitats along the natural coral reefs without losing their visitors, and the US $36 million they bring directly into the area each year. Approximately 400 sculptures will be created by internationally renowned underwater sculptor Jason deCaires Taylor and will then be sunk within this National Park on the barren areas of seabed at various depths. 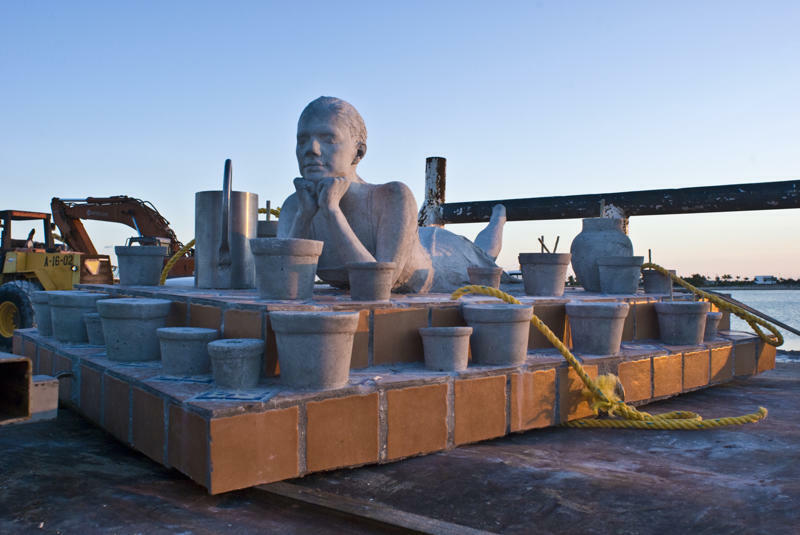 The first placing of sculptures will begin on November 14th 2009. Each piece of art will be life-sized, with a base of four square meters. There will be several theme based installations, such as an army of indigenous Mayan people entitled “The Silent Evolution” and other sculptures such as the “Dream Collector” who catalogues messages in bottles set adrift from various corners of the world. One of the first messages in a bottle attached to the above mentioned sculpture reads: “May our hearts, never become as hard as our heads”, by Roberto Diaz, President of the Cancun Underwater Museum. “This is a unique opportunity to explore the boundaries of art and combine it with reef conservation” said Jason de Caires Taylor, British underwater sculptor of the unique sculptures. The main piece will encompass between 300 to 400 lifelike figures based on actual living people. Once the main first phase of the project is completed other artists will be encouraged to submit their own sculptures and contribute to this unique museum. The National Park’s director, Jaime Gonzalez Cano, calculates that by April 2010 there will be approximately 250 sculptures in the underwater museum. ”The underwater museum will draw many visitors, allowing us to give a rest to the natural reefs. It’s like a restoration process”, Gonzalez explained. Upon the opening of the museum, divers will be required to gain experience in artificial habitats and snorkelers will continue to wear life jackets for buoyancy to prevent damaging the natural corals and the new artificial habitats. Pretty cool project, eh? You can visit the website of the sculpture artist, Jason de Caires Taylor, here.